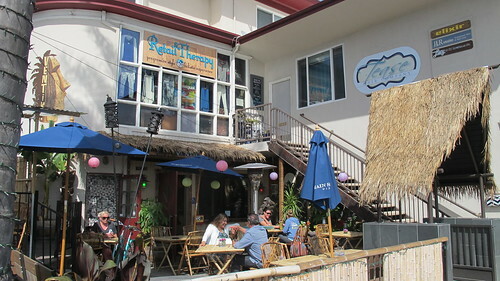 This new tiki bar in Ventura opened its thatched A-frame entrance to the public in July 2013. 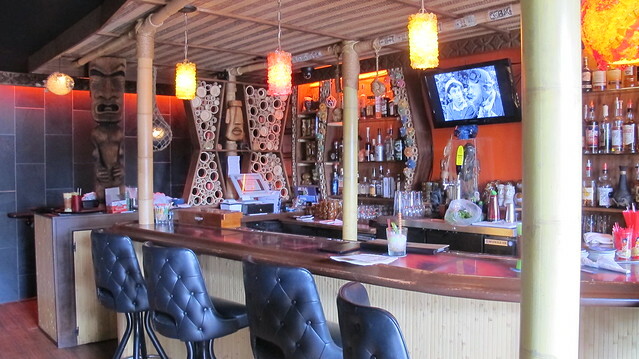 Owners Scott Noble and his cousin Stacey grew up visiting Polynesian-inspired restaurants and, along with their friend Kari Lewis, they’ve created their own slice of tiki paradise. 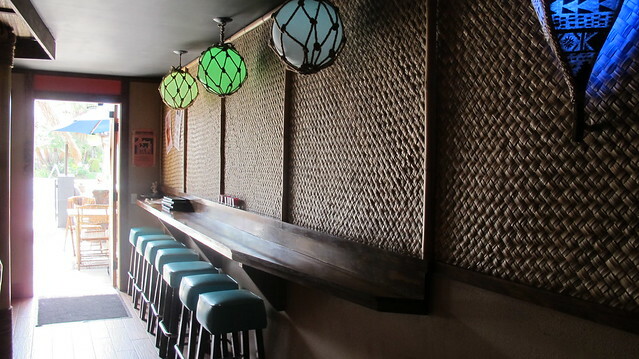 Meanwhile, there’s also a mid-century modern/vintage-style vibe from the hexagonal bar shelves, pop of bright orange paint, Witco wooden sword and resin chunk lamps (made by Nelson’s Tiki Hut). My favorite feature may be these borders filled in with pieces of bamboo in various sizes. That’s something I don’t think I’ve seen before. I’d say the best seats in the house are at the bar, though it’s tempting to enjoy the sunshine on the pet-friendly patio. 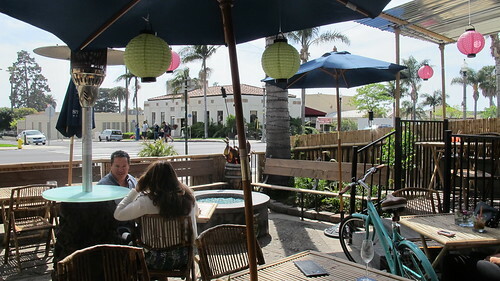 There are rattan tables and chairs plus an elevated little seating alcove among the palm trees, tiki torches and a blue rock firepit that must look neat at night. 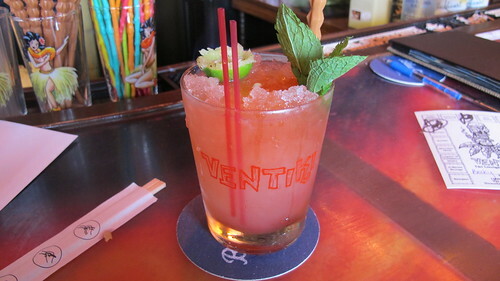 VenTiki’s cocktail menu features 11 “Classic Tiki” drinks, with each credited to its inventor, place of origin and year created — a little history lesson with your rum. 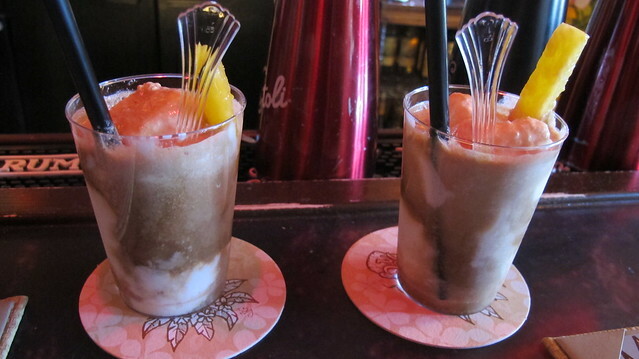 The Mai Tai ($11) is based on Trader Vic’s 1944 recipe, and it’s exemplary. Another favorite of mine is the Lapu Lapu ($12), here made with Ron Matusalem Clasico, Whaler’s Dark Rum, passion fruit, pineapple and citrus. A new chef is running the kitchen so the food offerings have evolved a bit. 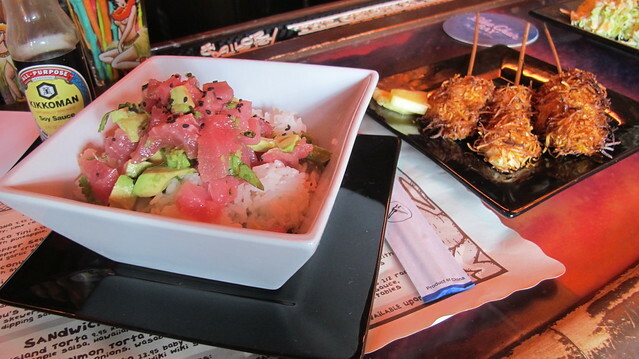 Build-your-own burgers, sushi and a few more poke variations have recently been added to the menu of pupus, salads and torta sandwiches with kahlua pork, salmon or seared tuna. 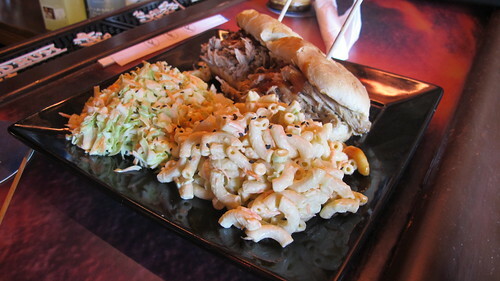 The latter come with a choice of sides: macaroni salad, potato salad, pineapple coleslaw, Hawaiian chips or sticky rice. 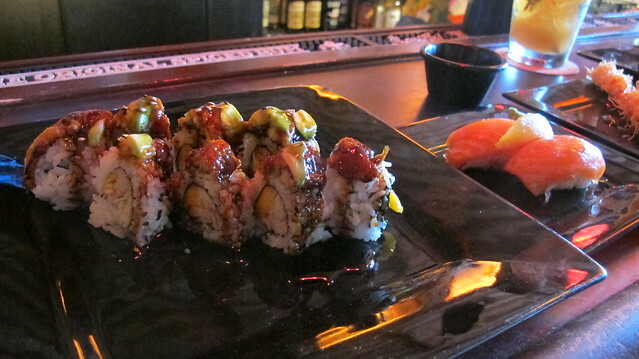 We were trying to decide on one of the sushi rolls, and they recommended the eel roll ($11.95), a tasty combination of blue crab and mango topped with eel, avocado and eel sauce. I also couldn’t resist getting an order of the Kraken salmon sushi ($4.95) so I could sample the Kraken rum sweet soy sauce. 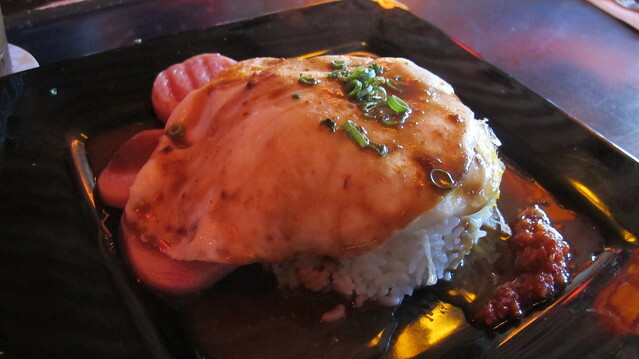 Cast all dietary cares aside and dig into the loco moco ($9.95), that infamous Hawaiian dish made with sticky rice, Spam, two eggs and brown sauce. I prefer my loco moco with runnier eggs and thicker gravy, but the sambal chile sauce gives this version a nice kick. 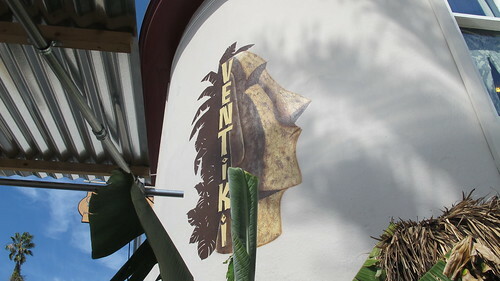 Hopefully I’ve convinced you that VenTiki is worth a detour, if not a dedicated roadtrip. 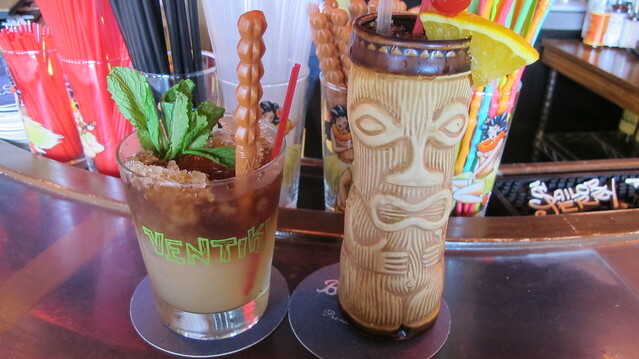 It’s just an hour-long drive from LA — provided the tiki gods don’t curse you with bad traffic. Another bonus? 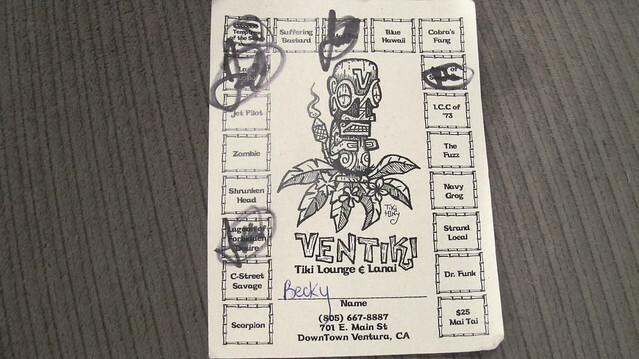 Within stumbling distance of VenTiki is the beach and the Ventura Pier. 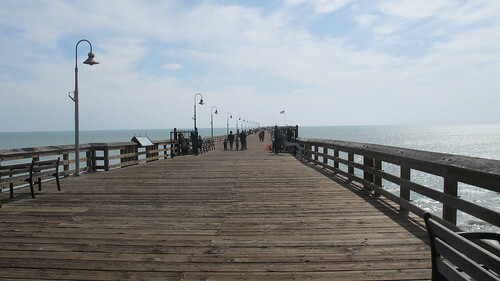 Just walk south on Ash Street for a few blocks and you’ll find the pedestrian bridge over the freeway to the beach. Thanks for the review! Couldnt have been more timely since the hubby and I were planning a trek from SLO down to Tiki Ti’s next Friday. Now I know where we are stopping for lunch! 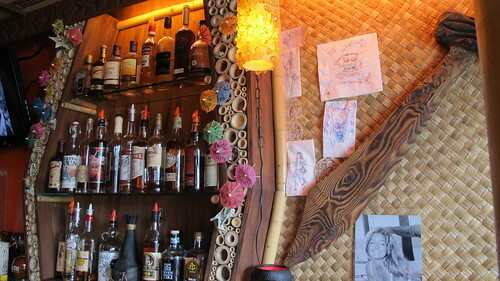 Tiki Chick, nice write up and pics. 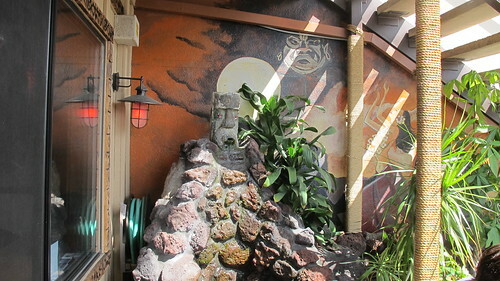 I was there recently and learned they are working on some drink “effects” (ala Trader Sam’s) as well as finishing off the retail area above the bar where they will sell work by familiar tiki artists (like Tony’s stuff, etc). That’s awesome! Even more reasons to keep going back. Thanx for the great write up! Here now having some drinks! Thanks for the review! That float looks tikilicious! Just trying to throw in a clever tiki pun.